I have to make it clear right from the start, this dram is much better than The Boondock Sainst movie. Redbreast 15YO has complexity and it strikes with force especially in the finish – a mobster movie comes to mind immediately. And of course it has to be an Irish mobster movie. After experiencing the 12YO, my expectations were high of course. High hopes were also well filled. 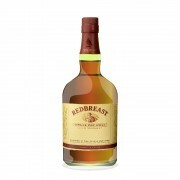 Redbreast 15YO is stunning. It has everything you need from a good whisk(e)y: complexity, character, sophistication. Nose: Dry citrus notes start the show with some red grapefruits and dash of sherry. The sherry notes get stronger with time. Bit sugary, black currant is present. Water adds dark fruits and notes of hay. Taste: Starts with bitter notes. Dry and sweet sherry with dried fruits. Reminds sweet red wine a little bit. Water brings fresh, yet bitter grapefruits and hints of dark chocolate. Finish: Bitter and peppery. Very, very fresh – like Fisherman’s Friend. Amazing salty and sweet licorice notes along with some sherry notes. Purely amazing this finish and aftertaste, full 25 points. Balance: Nicely in balance with a gorgeous finish. Rich whiskey, which starts with good aromas and gets better in every step. Great Irish Single Pot Still whiskey!